Alex Ovechkin sits third all-time on the career 50-goal seasons list behind Mike Bossy and Wayne Gretzky, who both had nine. 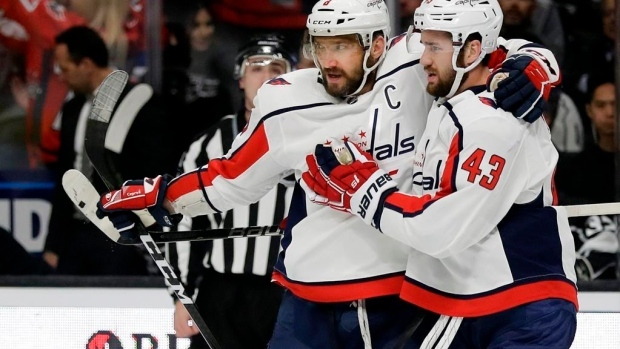 With two goals in the Washington Capitals final nine games, Ovechkin will post his eighth career 50-goal campaign and further close in on the two Hall of Famers. Ovechkin, who last posted a 50-goal season in 2016, has 48 goals and 82 points through 72 games this year. He has a five-goal cushion over Leon Draisaitl in the race for the Rocket Richard Trophy and is likely the only player who will hit the 50-goal mark this season. Since Evgeni Malkin scored 50 goals on the dot in 2011-12, there have only been three 50-goal campaigns in the NHL. All three belong to Ovechkin, who did it in consecutive seasons from 2013-2016. The 33-year-old has done it all in his NHL career – a Calder Trophy, three Hart trophies, 11 All-Star appearances and, most recently, a Stanley Cup. If he can close out winning his eighth Rocket Richard Trophy, Ovechkin will sit alone as the only player to ever lead the NHL in goal scoring eight times. He's currently tied with Bobby Hull at seven, and sits above Phil Esposito, who did it six times, and Gretzky, Charlie Conacher, Maurice Richard and Gordie Howe, who all led the league in goal scoring in five seasons each. Ovechkin is in a class of his own in today’s NHL. Since debuting in 2005-06, his 655 goals are 211 more than Sidney Crosby’s distant second-place total of 444. But so many of today’s top goal scorers haven’t been in the league that long, so it’s not a fair comparison, right? Wrong. Over the past five seasons Ovechkin’s 233 goals dwarf Vladimir Tarasenko, who is second with 177. Over the past three seasons? It’s still Ovechkin who bests fellow Russia and current NHL points leader Nikita Kucherov by a count of 130-114. Over the past two? ...You get the point. While many players show signs of slowing down at this stage in their career, the Capitals captain appears to be heating up. After a down 2016-17 campaign in which he had just 33 goals and 69 points in 82 games, Ovechkin posted his highest point total since 2010 last season at 87 and is five points away from tying that same mark this season. In an era of relatively limited goal scoring, Ovechkin has risen to 14th on the NHL all-time goals list with 655. He needs only 111 goals to catch Jaromir Jagr for third place all-time and is 146 shy of Howe in second. After that, it’s only Gretzky at the top with 894. At his career scoring pace of .609 goals per game, he projects to pass Gretzky in 393 games. Playing five more seasons - while keeping his current pace - is a lot to ask, but it’s possible. Given how he’s playing these days, almost anything is.